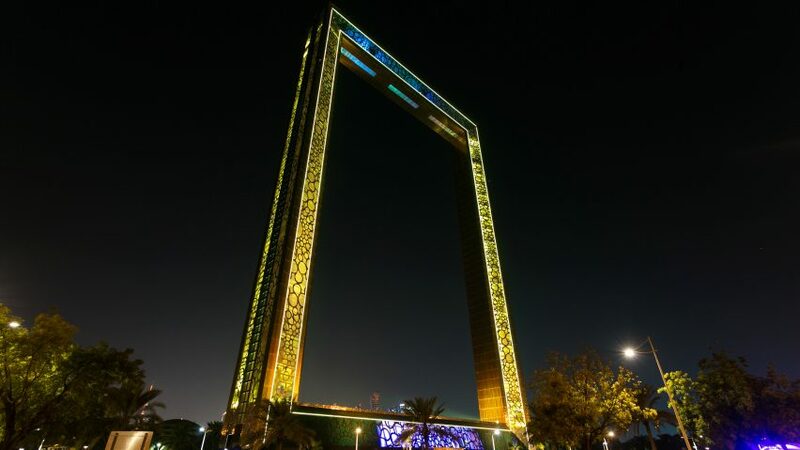 The controversial Dubai Frame has opened to the public, despite an ongoing copyright dispute with architect Fernando Donis, who won a competition to design the observation tower over a decade ago. 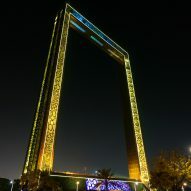 Comprising a pair of 150-metre-tall towers linked by a 93-metre-wide bridge, the Dubai Frame opened to the public in Za'abeel Park on 1 January 2018. A 25-square-metre glass panel in the floor of the bridge gives visitors views down over the the city, while a museum in the base tells the story of how Dubai transformed from village to metropolis. 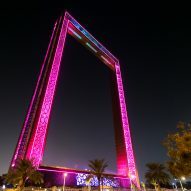 Rotterdam-based architect Fernando Donis designed the structure in 2008 for a competition organised by the Dubai Municipality and the German company ThyssenKrupp Elevator. But Donis claims he received neither a contract nor compensation for his design – bar a $100,000 (£74,000 today) prize for winning the competition. "They took my project, changed the design and built it without me," he told The Guardian in an interview to mark the opening. As the project neared completion last year, Donis told Dezeen: "Such copyright infringement to an important international competition regulated by UNESCO-UIA undermines the intellectual work of not only the 926 participants of the competition but all practicing architects." New-York based Klaris Law filed a suit for infringement of intellectual property on Donis' behalf in the US federal court against the Dubai Municipality and ThyssenKrupp Elevator, but the case never got off the ground. "The Dubai legal system makes it impossible to sue the municipality unless the municipality gives you authority to sue them. They give themselves sovereign immunity against any lawsuit," he told The Guardian. The £32 million project was constructed without further input from Donis, with decorative gold cladding taking the place of the ornament-free white facade of the architect's original design. The circular motif is based on the logo for the Dubai Expo 2020. Tickets to the Dubai Frame cost the equivalent of £10. Dubai's tourism board speculates the attraction will become as popular with visitors as the Burj Khalifa and Burj Al Arab.